The surface mount sampler is a new type of sampling valve which can be bolted on to the side or bottom of a vessel or large pipeline. In the case of a vessel mount, the valve is bolted to a pad flange on the side of a vessel. Surface mount samplers are commonly used for taking samples from large pipelines or from the sidewall of vessels. When large piping systems exist, it can be costly and difficult to install adequate sampling systems. The surface mount sampler can easily be added to a pipeline as a cost effective way to obtain a representative sample. In addition, the surface mount sampler can be installed onto the side of a vessel when the process fluid is difficult to sample. 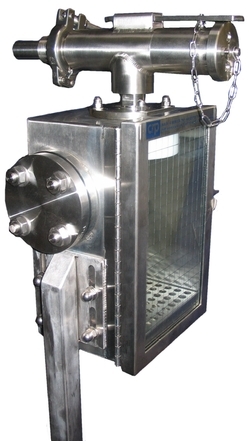 Samples can be taken when the vessel is under complete vacuum or when the product is too viscous to use normal dip tube sampling operations. The valve is most commonly supplied with a spring return safety handle. The standard valve has a 316L stainless steel body & spindle. The spindle is sealed from the atmosphere using a PTFE or Chemraz fluoropolymer tip seal. The tip is seal designed to eliminate dead legs on the process side of the valve. When the valve is operated the spindle is inserted into the process stream allowing process media to flow. The stroke limit of the spindle is adjustable and should be set when the unit is commissioned to give the correct flow rate. The valve is most commonly supplied with a purge and flush connection to allow purging or cleaning between samples.